It all starts with feeling good about what you put in your body. Hit the reset button with a 1, 3, or 5-Day Cold Pressed Juice cleanse. Don’t worry, we promise it won’t hurt. Ease into the juicing process with a one-day cleanse. Your body is built to eliminate toxins and waste and it works hard at it on your behalf every single day – give your body 24 hours to rest and heal. For beginners, the stressed-out or those who suffer from chronic inflammation or digestive issues. The three-day cleanse is a gentle flush of your system. For repeat-cleansers who work out regularly and eat a healthy diet. This cleanse is designed to renew your body while stimulating and supporting all your cleansing mechanisms. Rest the stomach & repair the gut. Flood your body with super nutrition. Eliminate harmful foods cellular healing. To get the most out of your cleanse, you’ll want to try to start weaning yourself off of your usual indulgences and making a few adjustments a few days before you start. You should ease yourself of stimulants such as caffeine, alcohol, sugar and nicotine. Two days prior to your cleanse start date, try to eat as light and raw as possible. Cut down or eliminate alcohol, caffeine, sugar, salt, artificial sweeteners, meat, fried and processed food and dairy products. We recommend eating wholesome foods such as leafy green vegetables, fresh fruit, sprouted foods, short grain brown rice and vegetable soups. Hydration is a key component to a successful cleanse, therefore we recommend increasing your intake of water. Congratulations! You’ve officially started your cleanse and are ready to start reaping the benefits of juicing. Start each cleanse morning with a glass of warm lemon water. Keep drinking at least eight glasses of water per day; supplement with herbal teas, hot water with lemon or ginger, and room temperature water. Make sure you are getting ample rest. Light walks or yoga is suggested but no rigorous exercise. Consider a massage or reflexology treatment. Try a skin brush or salt scrub to exfoliate your dead skin cells and open your pores. Treat yourself to warm baths and showers. Try a sauna, which will help you sweat and relax. Remember, while your digestive system is getting a lighter load, your body is adjusting to the clean nutrients you’re putting in and ridding itself of all the junk you just don’t need. A lot is going on and sometimes that can be a little overwhelming! If you need a pick me up, try a green tea or black coffee. If you must get a little food in you, have a few slices of jicama, celery or cucumber. Collect your juice cleanse purchases Mondays and/or Thursdays after 9 am from the Juice Hive (14 Johnston Way Bluffton, SC 29910). 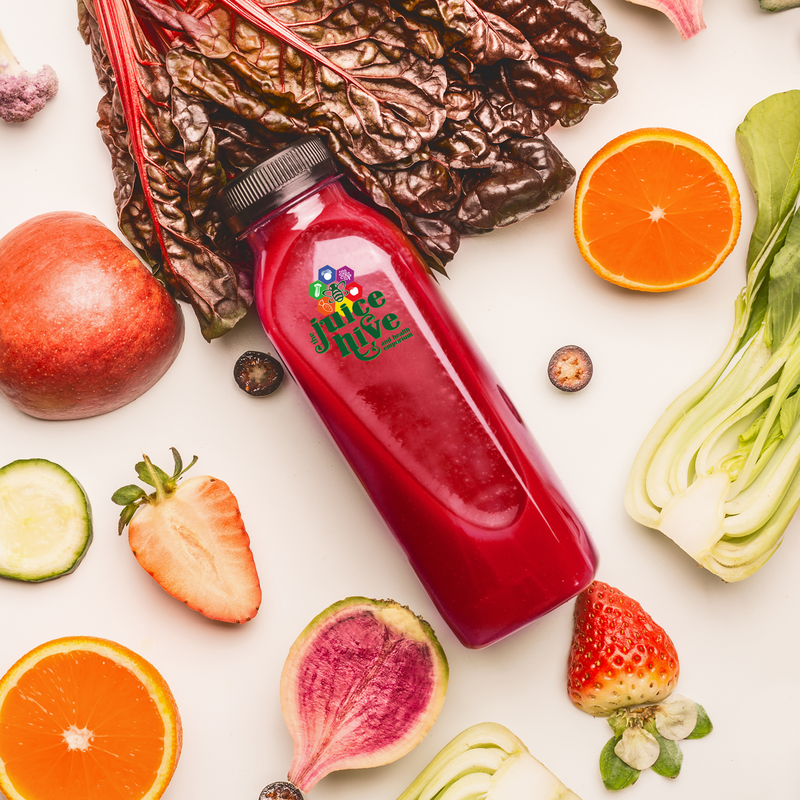 Cold pressing ensures the most nutritious and live juice possible, depending on the length of your cleanse, your pick up days will vary. You will need to bring your own cooler or insulated bag with you to keep your juices snug and cool on the go. Keep it with confidence for up 72 hours. All cleanses must be ordered and paid for in advance. Postponements have to be made at least 4 working days in advance. We are unable to entertain refunds. Juice recipes are not allowed to be amended. In the Indian practice of Ayurveda, ashwagandha has been celebrated for centuries for its therapeutic qualities. Strengthens immunity after an illness. Helps combat stress and anxiety. Improves learning and memory. Moringa Oleifera a.k.a “The Miracle Tree” is one the most nutrient rich plants on Earth. Moringa leaves contain 90+ nutrients, 46 antioxidants, and all of the essential amino acids making it a complete protein. A leader in the superfood category. It boasts iron, antioxidants, protein, vitamin B1, B6, copper, GLA and Omega 3’s. Chlorella helps support healthy muscles, skin, immune health and healthy blood, sugar and cholesterol levels. Pine Pollen has been used in Chinese Medicine for centuries. Supports immune function. Boosts energy. And rejuvenates skin. Pine pollen is kind of a time machine for your endocrine system, taking it back to visit an earlier version of itself. We recommend that you consult your doctor prior to use if you are considering a juice cleanse or taking dietary supplements for the first time. If you’re pregnant, nursing or have a pre-existing medical condition — or if you’re feeling overly stressed or overwhelmed — it’s best to avoid cleansing. If you are training for an athletic competition or run down from a cold or virus, it’s best to wait until you have at least two weeks to devote to cleansing.